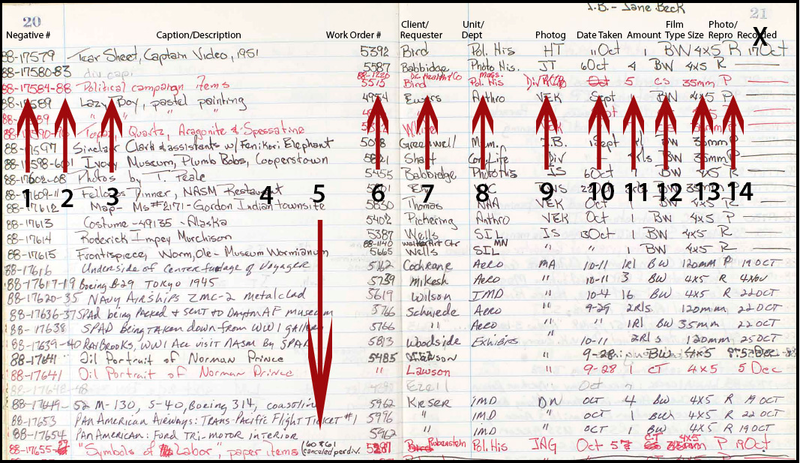 This project is transcribing Smithsonian Photographic Services (SPS) Negative Logbooks; these books catalog images of events, exhibits, artifacts, and copies of archival photographs captured at the Smithsonian over a thirty year period (1971-1999). You’ll transcribe data from fifteen columns, row by row (or line by line). Each image is a photograph of two logbook pages. Please read the instructions below for details of how to transcribe each column. This project is transcribing fifteen columns, row by row (or line by line). When you enter data in the bottom-most row, a new row will be generated. The “Neg # (start)” and “Neg # (stop)”or Negative # columns list the number or range of numbers assigned to one or a series of images. The first two digits refer to the year the photograph was assigned a number (Ex. 73-4500 was assigned a number in 1973). The second number is sequential. (Ex. 73-4500, 73-4501, 73-4502, etc.) Use Column 1 for individual images or for the beginning of an image range. Use Column 2 to note the last number in a range. (Ex. 73-8122-24 is the negative range of 73-8122 thru 73-8124 and becomes 73-8122 in Column 1 and 73-8124 in Column 2.) These numbers are not necessarily unique. If a photo shoot was captured in multiple formats, those formats are listed as separate entries with identical negative numbers. Where a “ (ditto mark) appears, please copy the data from the record above. If an entry has “Restricted” included in the description, record that information in Column 4. If an entry has notes about the film, record that information in Column 5. Use the “Restrictions” column to make note of when an item is listed as “Restricted” in the Caption/Description. For restricted items, list the entry as “Restricted” in Column 4. For non-restricted items, leave this column blank. Use the “Description Notes” or Caption/Description Notes column to transcribe any notes included in the Caption/Description. A common thing to see that should be transcribed in the Notes is “NIF” with a date. This means that the film is no longer on file. Other examples of notes might be cross-reference information about related film. The “Work Order #” or Work Order Number column contains information about the work order number assigned to the photo shoot. This field can be transcribed directly. If multiple work order numbers are recorded for a set of items, include all numbers separated by a comma. Where a “ (ditto mark) appears, please copy the data from the record above. Column 7 designates the Client or Requestor and the column contains information about the person who requested the photo shoot. This field can be transcribed directly. Where a “ (ditto mark) appears, please copy the data from the record above. Column 8 describes the "Department," or which unit or department requested a photo shoot. Data in this field is usually an acronym or in abbreviated form. This field can be transcribed directly. Where a “ (ditto mark) appears, please copy the data from the record above. In Column 9, you’ll transcribe details of the “Photogr” or photographer assigned to the photo shoot. Data in this field usually contains the initials of the photographer. If multiple photographers are listed for a set of items, include all sets of initials separated by a comma. This field can be transcribed directly. Where a “ (ditto mark) appears, please copy the data from the record above. NOTE: Sometimes this column appears after the “Date” column. Please record the data in its corresponding field. The “Date” column contains information about the date of the photo shoot. Dates should be transcribed as MM/DD/YYYY or MM/YYYY. Note that sometimes the entries are ‘backlogged’ slightly and the year the photo was taken may not match the year represented in the negative number. This usually coincides with the new year. For example, items photographed in December might not be assigned a number until January of the following year. Items coming from “STRI” (Smithsonian Tropical Research Institute) often have dates that go back a few years from the date a number was assigned to the film. Where a “ (ditto mark) appears, please copy the data from the record above. NOTE: Sometimes this column appears before the “Photog” column. Please record the data in its corresponding field. The “Amount” column contains information about how many items were assigned numbers for a photo shoot. Information contained here should equal the amount of negative numbers assigned to a range. Note that when rolls of film were shot, that information is contained in the “Amount” field and listed either as “rl” or “rls.” This field can be transcribed directly. Where a “ (ditto mark) appears, please copy the data from the record above. Transcribe to fit the preferred abbreviation and omit any unnecessary punctuation. For example, “BW” is the preferred abbreviation for black and white negatives and should be substituted for “B/W” or “B.W.” In rare instances the “Film Type” might be listed as “Glass” and can be transcribed as such. Where a “ (ditto mark) appears, please copy the data from the record above. The “Film Size” column contains information about the size of film used for the photo shoot. Be consistent with character spacing. For example, use 35mm not 35 mm or 4x5 not 4 x 5. Where a “ (ditto mark) appears, please copy the data from the record above. This field can be transcribed directly. Where a “ (ditto mark) appears, please copy the data from the record above. If there are any annotations or other notes that relate to the whole page, please note that in this column on the first row of data. It can be transcribed directly.